1370 Washington Ave, Ste 302. Samsung Galaxy Note9 International Version (Not compatible with Samsung Pay). All our phones are brand new unless specified otherwise. Our phones are factory unlocked and come with all original accessories in original box. Our phones might come with International Charger. A free US adapter will be added to your order for free if needed. GSM / HSPA / LTE. GSM 850 / 900 / 1800 / 1900 - SIM 1 & SIM 2 (dual-SIM model only). HSDPA 850 / 900 / 1700(AWS) / 1900 / 2100. TE Cat18 700/800/850/900/1700/1800/1900/2100/2600 (Bands 1,2,3,4,5,7,8,12,20,28,29,30). TD-LTE 1900/2300/2500/2600 (Bands 38,39,40,41). HSPA 42.2/5.76 Mbps, LTE-A (5CA) Cat18 1200/200 Mbps. 161.9 x 76.4 x 8.8 mm (6.37 x 3.01 x 0.35 in). 201 g (7.09 oz). Front/back glass (Gorilla Glass 5), aluminum frame. Single SIM (Nano-SIM) or Hybrid Dual SIM (Nano-SIM, dual stand-by). Super AMOLED capacitive touchscreen, 16M colors. 6.4 inches, 103.2 cm. 1440 x 2960 pixels, 18.5:9 ratio (516 ppi density). HDR10 compliant - Always-on display. Exynos 9810 Octa (10 nm) - EMEA Qualcomm SDM845 Snapdragon 845 (10 nm) - USA/LATAM, China. Octa-core (4x2.7 GHz Mongoose M3 & 4x1.8 GHz Cortex-A55) - EMEA Octa-core (4x2.8 GHz Kryo 385 Gold & 4x1.7 GHz Kryo 385 Silver) - USA/LATAM, China. Mali-G72 MP18 - EMEA Adreno 630 - USA/LATAM, China. MicroSD, up to 512 GB (uses SIM 2 slot) - dual SIM model only. 512 GB, 8 GB RAM or 128 GB, 6 GB RAM. 12 MP, f/1.5-2.4, 26mm (wide), 1/2.55", 1.4µm, dual pixel PDAF, OIS 12 MP, f/2.4, 52mm (telephoto), 1/3.4", 1.0µm, AF, OIS, 2x optical zoom. 8 MP, f/1.7, 25mm (wide), 1/3.6, 1.22µm, AF. 32-bit/384kHz audio - Active noise cancellation with dedicated mic. Wi-Fi 802.11 a/b/g/n/ac, dual-band, Wi-Fi Direct, hotspot. 5.0, A2DP, LE, aptX. Yes, with A-GPS, GLONASS, BDS, GALILEO. 3.1, Type-C 1.0 reversible connector. Iris scanner, fingerprint (rear-mounted), accelerometer, gyro, proximity, compass, barometer, heart rate, SpO2. Samsung DeX (desktop experience support) - Fast battery charging (Quick Charge 2.0) - Qi/PMA wireless charging (market dependent) - ANT+ support - Bixby natural language commands and dictation - MP4/DivX/XviD/H. 265 player - MP3/WAV/eAAC+/FLAC player - Photo/video editor - Document editor. Non-removable Li-Ion 4000 mAh battery. Metallic copper, lavender purple, ocean blue, midnight black. Basemark OS II: 3377 / Basemark OS II 2.0: 3064 Basemark X: 41994. Contrast ratio: Infinite (nominal), 4.531 (sunlight). Voice 71dB / Noise 74dB / Ring 80dB. Noise -93.7dB / Crosstalk -94.1dB. The new super powerful Galaxy Note9. Do what you can't. Galaxy Note9 puts powerful technology in the hands of pioneers who demand more. Powerful enough to keep up with you. Processor speeds The processor built for speed. Whether you're gaming, streaming, or multitasking, the 10nm processor and 8GB RAM deliver cutting-edge performance so you can get it done in a flash. 3 Faster CPU 33% Faster GPU 44% RAM 8GB. Introducing a powerful, all-day battery that goes the distance in a single charge. 1 Its long-lasting and 21% larger than the Note8, so you can enjoy not being tethered to a charger. With the power of 128GB storage built in and up to 512GB of expandable storage, you'll have room for what matters most. Availability and launch date may vary by country. Level up your gaming with a cutting-edge processor that cuts down on lag time. The water-carbon cooling system also helps prevent overheating while an AI-based performace adjuster helps your experience stay smooth. 3 Interested in the exclusive Fortnite Galaxy Skin? Image simulated for illustration purposes. Epic Games, Fortnite, and their logos are trademarks or registered trademarks of Epic Games in the USA Reg. Our largest Infinity Display ever. Infinity Display: a near bezel-less, full-frontal glass, edge-to-edge screen. A monochrome metal frame stylishly sets the Infinity Display with varying S Pen colors to suit your style. S Pen All new S Pen with remote control. 4 It's as intuitive and natural as a pen and paper with a fine tip and more pressure levels than ever. Dual Aperture adapts like the human eye for stunning shots, day or night. The rear wide-angle lens supports F1.5 and F2.4 modes. The Galaxy Note9 intelligently recognizes what youre looking at, optimizing color settings like contrast, white balance and more. 6 By detecting blinks and blurs, it makes it nearly impossible to take a bad shot. Stay stylish and powered up with cases and wireless chargers. Immerse yourself in a cinematic experience. Pixels per inch 516 Resolution 2960 x 1440 Enjoy the uninterrupted view of the Infinity Display's edge-to-edge screen, which enriches your entertainment experience. The iris scanner and sensors are hidden away, minimizing visual disruptions. We "Guarantee" that we will make our best efforts to make you 100% satisfied! Customer service is our highest priority. Our trained and experienced representatives will answer any questions you may have before, during or after you place your order. Sobeonline1 makes every effort to get your order out as soon as possible. Below is a link that explains how to confirm it. International Buyers - Please Note. Replacement We will send a product replacement after the authorized return has completed our receiving/inspection process. Please allow additional processing time after Holidays. Battery, charger, cords, straps, etc. The RA number or any other inscriptions must not be written or printed on the product box or packaging. We will not process the return if any of these conditions are not followed. All our phones are brand new unless specified. Our phones come with all original accessories in original box. Our phones are international and might come with International (American or European) Charger. (Our phones do not work with CDMA carriers like Verizon, Sprint, Boost, or any other CDMA Network Carrier). We do not guarantee, imply or express warranties unless otherwise stated in the listing. Address cannot be changed at any time. Other: We have the right to cancel the order under the following circumstances. In case of a Pricing Error. This policy may be modified or changed without any further notice. Samsung Galaxy S9+ Plus SM-G965F/DS Dual Sim (FACTORY UNLOCKED) 6.2 64GB 6GB RAM. Samsung Galaxy S7 Edge SM-G935T 32GB 4GB RAM (Unlocked) 5.5 12MP Android GSM. SOBEONLINE1 1370 Washington Ave Ste 302 Miami Beach FL 33139. 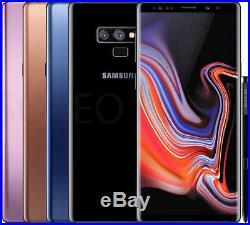 The item "Samsung Galaxy Note 9 SM-N960F/DS 128GB (FACTORY UNLOCKED) 6.4 Exynos 9810" is in sale since Sunday, August 5, 2018. This item is in the category "Cell Phones & Accessories\Cell Phones & Smartphones". The seller is "sobeonline1" and is located in Miami Beach, Florida.